The Alfa Romeo MiTo three-door subcompact gets its electric power steering from Delphi. This fully electric system, which includes a mechanical gear from TRW Automotive, requires no hydraulic fluid so leakage problems are eliminated. It is estimated that electric power steering saves automakers approximately 190,000 liters of hydraulic fluid for every 100,000 vehicles produced. 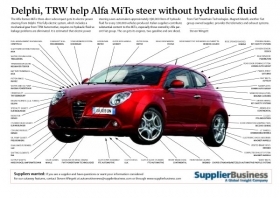 Italian suppliers contribute substantial content to the MiTo, especially those owned by Alfa parent Fiat group. The car gets its engines, two gasoline and one diesel, from Fiat Powertrain Technologies. Magneti Marelli, another Fiat group-owned supplier, provides the telematics and exhaust systems.